« The Road To Big Sunday: D(istribution)-Day! The passing of Filipino community icon Faustino “Peping” Baclig last March inspired filmmaker Rod Pulido (brother of Cerritos city councilman Mark Pulido – see how all these previous posts tie in together?) to dust off his film reel and do a 10th anniversary screening of his 2001 film, The Flip Side. The decidedly-filmed black and white feature-length had Baclig play the grandfather character in the movie, and was intended this time around to screen as a tribute to the World War II veteran as part of the L.A. Asian Pacific Film Festival at the Sunset Laemmle 5 theatre in Hollywood. 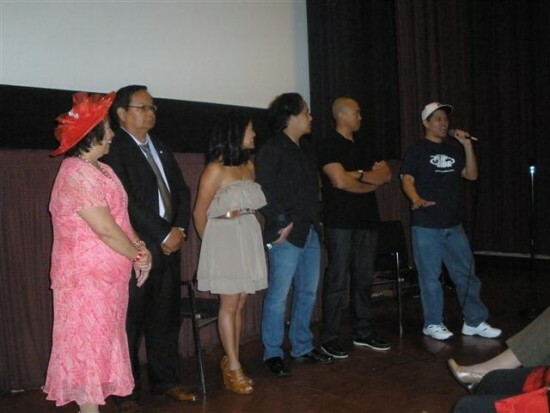 The film was notable upon its release as the first Filipino American film to screen at the Sundance Film Festival. For the uninitiated, it was a comedy film about a suburban Filipino American extended family centered around the family’s three siblings,: a whitewashed sister, a blackwashed brother and a main character whose come home for the summer after coming to a cultural awakening as a Filipino in college. All three characters play up to an extreme archetype, which ensues in hilarity. A decade later, and though the underlying theme of Filipino American identity isn’t as urgent as it is in the 2011 world, it doesn’t seem that dated. At the end of the film, Pulido and the cast engaged in Q and A, and the filmmaker talked about the post-Sundance exposure into the Hollywood mainstream and how it soured him. But the day was about reuniting, celebrating and remembering the film’s late castmember. Baclig’s family was in attendance, and his grandson, O.J. Baclig, even showed a trailer of the documentary film about his grandfather, intended for release this Veteran’s Day.